It was a humbling experience, standing in front of a a hundred plus Tibetan immigrants in a hall in Burnaby on a Saturday evening not long ago. 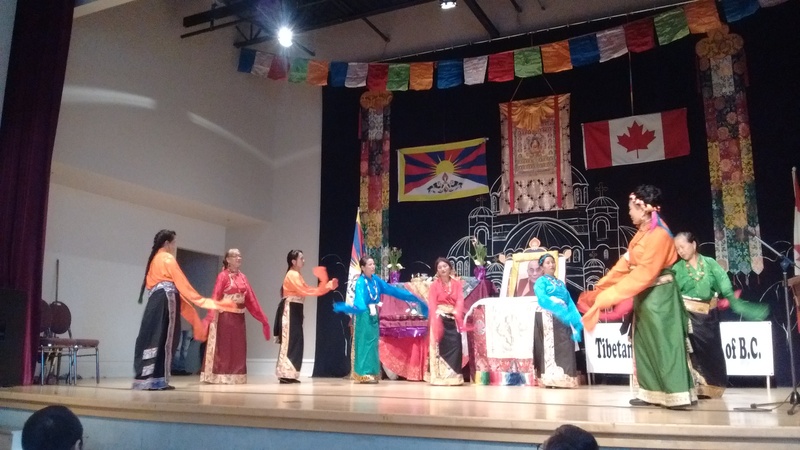 The Vancouver Cultural Society was officially marking the end of Canada’s Tibetan Resettlement Project, an undertaking that resettled 1000 Tibetan Buddists from Arunachal Pradesh in remote northeast India. Officially called stateless or displaced persons, the parents and grandparents of these Tibetan folks became isolated in the northeastern Tribal States of India, a place rife with poverty, when they followed the Dalai Lama out of Tibet many years earlier. So remote were the settlements, that even the Dalai Lama’s Government in Exile did not know they existed for the first while. Canada’s five year private sponsorship program officially ended in December of 2017, with the last people arriving in March of 2018. All sponsors and volunteers in the province of British Columbia were invited to this appreciation dinner, along with the new Tibetan families and other Tibetans already living in Vancouver. Sadly, the many sponsors and Tibetans from Victoria, Vancouver Island were not able to attend, and we met only a handful of folks from Vancouver. Don and I were the sole representatives of our sponsorship group on the Sunshine Coast. Our Coordinator, who sponsored three families, was there with her partner. Our group sponsored a family of four, the Mom, who arrived with almost no English, with her two teenage children in December of 2013, and the Dad, who followed four months later, unable to get his discharge from the Indian Army until then. Another son remained in India, at age 22 too old to be included in the family application. The Prime Minister at the time, Stephen Harper, to his credit, had agreed to the Dalai Lama’s request to resettle the displaced Tibetans in Canada. Becoming involved in Canada’s somewhat “under the radar” project, (the Canadian government did not want to offend its Chinese trading partner), was a spiritual calling on our part. There are no accidents. Our many friendships with Tibetans living in exile in Dharamshala, India, developed during five visits spanning ten years, had led us to join the Canada Tibet Committee, and we were notified of the first sponsorship organizational meeting in early 2012. Our application went in during the summer of 2012. We hit the ground running when our family arrived, the demands were great in the early days. Gradually the family members became more self sufficient and we were needed less. Despite the small size of our community and scarcity of good jobs, our family and indeed all the families on the Sunshine Coast have done very well, working hard at whatever jobs were available, then gradually moving into more skilled areas. The appreciation dinner and entertainment evening went quickly. At 10 pm we were readying ourselves for the dash to the last ferry, when we were called up on the stage. We were introduced to the audience and honoured with a khata scarf by the wise Rinpoche from the Vancouver monastery. Every action we took on behalf of our Tibetan family, and for our Tibetan friends in India, brought us appreciations tenfold over. Each small gesture has been acknowledged many times more than we ever expected or wanted. Their gratefulness was very humbling. Yes, we have helped our family start a new life in Canada, and helped other Tibetans in small ways in India, but I do not think they realize how they have enriched our lives, and the heart opening we have experienced as a result. In the future, I plan to tell our Tibetan family that they have changed our lives also, and we are blessed to call them our friends. My Romance with India – is it Finished? What a beautiful and thorough accounting of an amazing process. An accounting that shows clearly the many riches that return to the giver. I think this article would be good to send to the Coast Reporter. Thank you Rose. I will think about that. What a wonderful thing that you have been honoured for all your work for on this project. The Sunshine Coast community has been enriched by the presence of the Tibetan families you have worked to bring here. Thank you to you and Don. Thank you Carol, for taking the time to write, & for your uplifting comments. We have certainly been enriched by our involvement in the lives of the many Tibetan families on the Coast, & now also with the two Syrian families.